During our reservoir tour, guests will spend the afternoon with one of our excellent instructors at Horsetooth Reservoir. 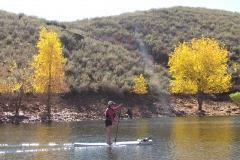 This tour offers the opportunity to get a good workout, relax in the outdoors and learn the basics of SUP. Join us for a peaceful yoga session on the tranquil waters of Horsetooth Reservoir. Our classes will kick your yoga practice up a notch!